We find ourselves on the verge of another presidential election year. 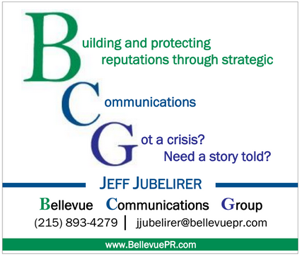 The Keystone State has been at the center of the battles over the White House for decades now and with the DNC in Philadelphia next July that won’t change in 2016. What can we learn about our commonwealth, though, by looking at the results of the last few presidential contests? I’ve compiled a county-by-county breakdown of Pennsylvania over the last ten presidential elections spanning thirty years. In that time, PA went Democratic in the nail-biting 1976 contest before turning Republican during the Reagan-Bush dynasty. Since then, though, the state has gone Democratic six straight times. Through some digging it is possible to examine how Pennsylvania has evolved over time. The peanut farmer from Georgia ran exceptionally well in the Southwest and Northeast but besides from Philadelphia was shut out of the Southeast. Overall, despite the maverick nature of Carter’s campaign PA’s electoral shift was still to come. The incumbent President won just ten counties, the lowest total on this list. His numbers came almost exclusively from the Southwest. Only Philly and Lackawanna County (Scranton) also supported him. Reagan’s victory was the first of a GOP trilogy in the U.S. and PA. The high-point of the Reagan Revolution, the Gipper’s 1984 voter share is the best by a Republican in the last three decades. Nevertheless, Mondale actually outperformed his old running mate by winning over Armstrong and Mercer counties. Reagan, though, became the only GOP nominee since 1976 to win Lackawanna. This map is worth remembering as you see the change sweep over the area east of the Susquehanna. Now is when the first wave of changes comes. Clinton not only holds the Dems’ Southwest-Philly-Scranton trio but he expands the party’s reach. For instance, five counties in the Southeast: Bucks, Delaware, Lehigh, Montgomery and Northampton will go Democratic every election from now on. He also prevailed in Centre County (home of Penn State). You can clearly see a blue corridor develop for the first time on the state’s eastern border. Finally, Clinton won the Northwestern part of the state. 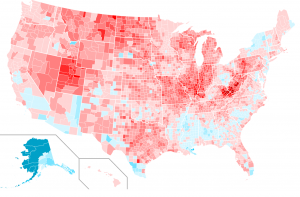 1996 was the high-point for Democrats in terms of total counties won. The 42nd President largely replicated his 1992 performance. The map makes one question Clinton advisor James Carville’s classic description of PA as Pittsburgh and Philadelphia with Alabama in the middle. As you’ll see, though, the Dems never held such West/East parity again. The streak is over, Pennsylvania finally deviated from the nation’s choice for President (although Gore did famously win the popular vote). Despite Gore’s Appalachian roots, he was the man at the top of the ticket as the Democrats’ hold on the Southwest began to erode. 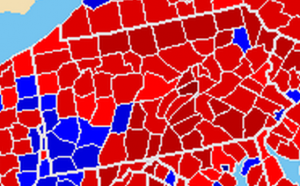 Just as integral, he was able to win the state by retaining an advantage on the Eastern border from Philadelphia and Southeast up through the Lehigh Valley to Scranton. For the first and only time during this time period the winner of Pennsylvania did not win the popular vote, as John Kerry kept the Democrats’ Keystone streak alive. He could not, however, keep the party on top in the Southwest. For the first time, counties like Greene and Washington went GOP with Kerry running behind Walter Mondale there. Yet he was still able to hold onto the Philly collar counties. A new landscape was nearly complete. Barack Obama delivered the best performance in the Keystone State over the past thirty years during this contest. Not only that, he did it with just Allegheny County in the Southwest. 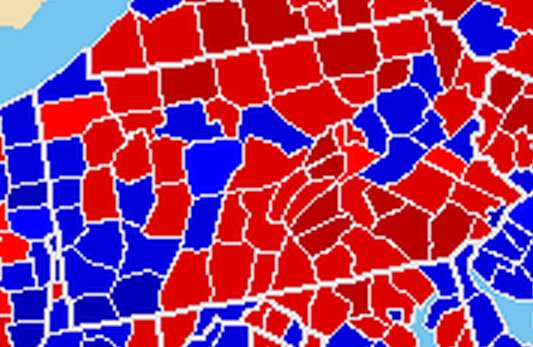 This was the second large shift, with the eastern half of the state clearly blue and the western half clearly red. McCain tried a Hail Mary here, but Obama dominated the Acela Corridor, bringing Berks, Chester and Monroe counties into the Dem column for the first time. His other big victories were snagging Centre County (and PSU) back while winning Dauphin County, home to the state’s capital city, Harrisburg. Much like McCain, Romney staked his chances on a last ditch effort in the Keystone State. The former Massachusetts Governor did better than his predecessor but not good enough. It’s as simple as this, Pres. 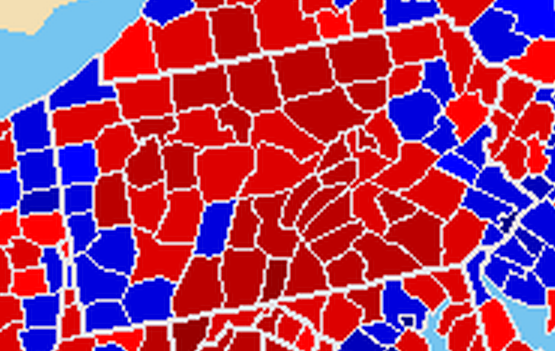 Obama held the cities (Philly, Pittsburgh, Erie, Harrisburg, Scranton) and maintained the eastern border of the state. By 2012, that was more than enough to win our twenty electoral votes. 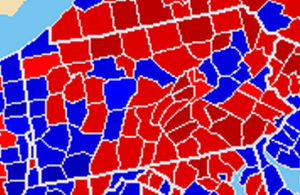 In the 1970’s and 1980’s small-town Pennsylvanians were the core of the Democratic Party. By 2008, Barack Obama was trying to explain why they had left. Despite the exodus of rural voters, though, the Democrats have won the state in six consecutive contests. As I’ve written before, PA is unique in that the it contains parts of the most conservative and progressive stretches of the country, the Appalachian and Acela Corridors. The former is self-explanatory, covering the mountain range that runs through western Pennsylvania down through sections of Kentucky, North Carolina, Tennessee and Virginia. These areas were once solidly Democratic and are now perhaps the most conservative in the nation. West Virginia is the greatest example of this. In 1996, Bill Clinton won 46 of the state’s 55 counties. In 2012, Barack Obama won zero. Obama ran five points ahead of Kerry nationwide and did better nationally everywhere except for three areas: 1. McCain’s home state of Arizona 2. Southern Louisiana (which for one very obvious reason lost a lot of black voters over that time period) 3. The Appalachian/Bible Belt bell curve that runs from North Texas all the way to Western Pennsylvania. Concurrently, the Acela Corridor (named after the Amtrak line) has expanded. The D.C.-Baltimore-Philadelphia-New York-Boston concentration of Democrats has spread from Northern Virginia, into Upper Delaware, Southeast PA, Central NJ, Southern NY and practically all of New England. For us, the most intriguing developments are whether Scranton and even Harrisburg are becoming part of the Acela Corridor. Romney ran about a point and a half ahead of McCain’s performance but his strongest area comparatively (except perhaps for Mormon-heavy Utah) was in the Appalachian areas of Kentucky, up through West Virginia and Pennsylvania. It’s also worth pointing out that in Philadelphia and Scranton, the President ran ahead of his 2008 numbers. Not surprisingly, these two very different types of people don’t exactly get along. There’s a reason Pres. Obama felt he had to explain Appalachians to party donors and a reason why those people took such umbrage at his description. The Democrats, though, can afford to lose Appalachian voters for the simple fact that there are less of them. Ever since the Roosevelt Coalition, the Democrats were an urban and rural party. As the suburbs grew in the latter half of the twentieth century, however, politicians like Richard Nixon and Ronald Reagan were able to win them over to the GOP. It’s important to remember that Stan Greenberg’s famous study of “Reagan Democrats” concerned the suburban, not rural, voters of Macomb County just north of Detroit. 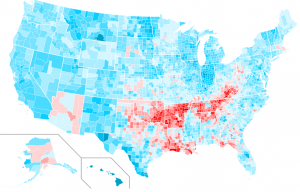 A county, by the way, that Barack Obama has won twice. 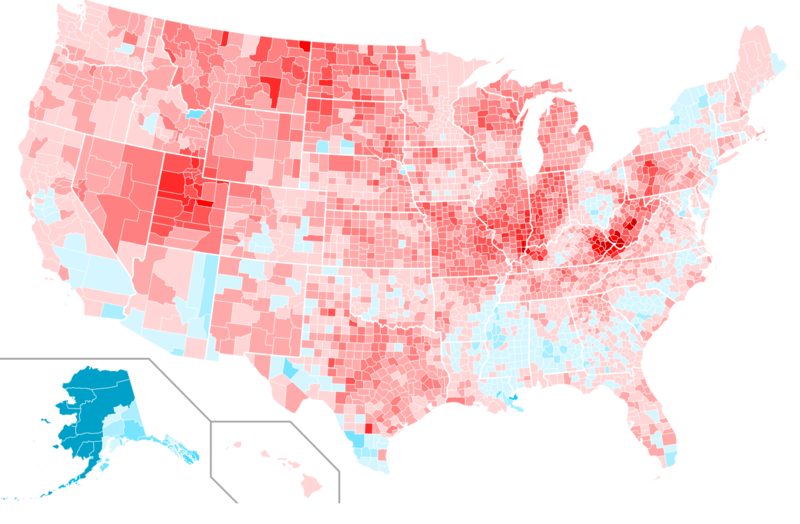 As the maps above indicate, Democrats have shifted to an urban-suburban party and the Republicans a rural-suburban party. This gives Democrats a statewide advantage (more people) and Republicans a congressional edge (more area). From 1968 through the 1980’s, the GOP often held the White House while Democrats ruled in Congress. Since the 1990’s, and for the foreseeable future, the Dems seem to have the inside track to the White House while the Republicans have a hold on the Capitol. This nationwide trend extends to, and is exemplified in part, by the Commonwealth of Pennsylvania. So, impossible as it may seem, there are definitely tea-party seniors in Western PA who today consider Ronald Reagan the country’s greatest President but who voted for Carter and Mondale in the 1980’s. Meanwhile, there are also middle-aged Reagan Revolutionaries in the Philly suburbs who supported Barack Obama twice. Politics sure does make strange bedfellows, huh? Controversial as he has been made out to be, Ralph Nader has accurately called for the inevitable “Left / Right” alliance.. guy wrote a whole book about it. 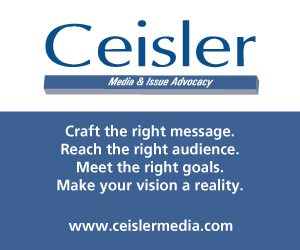 There are dozens of topics which bind conservatives and liberals, that would otherwise be left out of the media’s political dialogus – for the exact purpose of mitigating against a populist movement. As the history/present/ projections suggest, those dynamic conservatives and liberals are very well aligned to find unity with the Bernie Sanders campaign (or Trump, if he remains bouyant), BUT NOT with Clinton or Bush. Interesting study. My home county of Westmoreland is a perplexing question mark through it all. Our population is primarily suburban (many transplants from Allegheny County), but seem to vote the values of Appalachia. 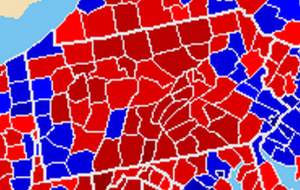 The Republican gains in Southwest PA that mirrors the rest of Appalachia began long before Obama in 2008 as evidenced by these maps. To me the most interesting map is the shift from 2004 to 2008. Some of the counties with the biggest DEM gains were in deep red South Central PA. Obama won Dauphin County–unheard of for a DEM since Reconstruction and the usual 65%+ percentage by the Republican nominee in Lancaster County was cut into the 50’s. There is a crescent of growing Latino voters from the Lehigh Valley to Berks, Lebanon and down into York and Lancaster counties that will impact PA voting patterns. 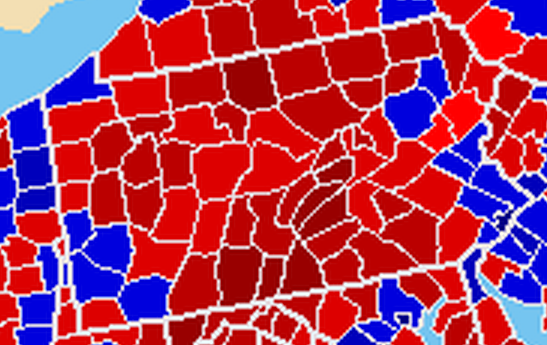 Southwest PA will continue to become more Republican but not the rest of the state.